What to do: Give your child a drink of water to wash the silica gel beads down to the stomach. Note: If your child got some silica gel beads into their eyes, call the Missouri Poison Center for help on how to rinse the eyes. Silica gel comes in small paper packets that are included with many kinds of items bought at the store. For example, it is often found with shoes and purses, cameras and cell phones, in the pockets of coats and jackets, and in bottles of medicine such as vitamins. Silica gel sometimes looks like little clear, round beads, and sometimes like very small rock crystals. It is a “desiccant” which means it keeps things dry. It pulls water into itself so that mold and musty odors don’t get started and damage the items. These small packets are often tossed aside when the new items are unpacked at home and used for the first time. A small child may find a silica gel packet and begin to chew on it. They may even eat the small beads. Older children and grown-ups can mistake it for a package of salt that often comes in carryout food. If a small child stuffs the whole paper packet in their mouth it could make them gag or choke. If your child is choking on a silica gel packet, dial 911 right away for help! 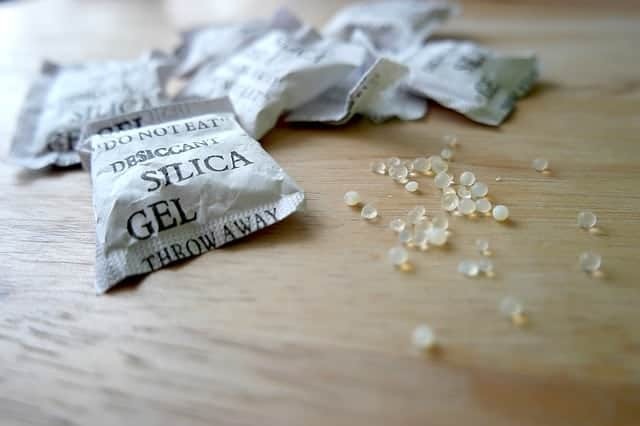 If your child is eating a silica gel packet, just take it away from them and give them a drink of water. If problems start or if you have more questions, call the Missouri Poison Center right away at 1-800-222-1222. The poison center is open all day, every day for poisoning emergencies and for questions, too.